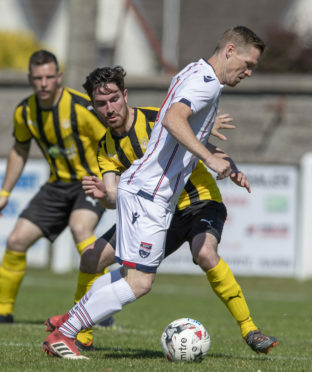 Callum Maclean has signed a new contract with Nairn County. They went to university together, work together and followed each other in the Highland League from Fort William to Nairn County three years ago. Therefore, it made sense for them to sign contract extensions on the same day. Maclean said: “It’s quite funny that we’ve ended up doing the same thing and it would be very different if one or the other of us was to leave. “We go back a long way and it would be strange not playing together. We’re good friends away from football and with working and playing together, we end up at a lot of the same events. “At the moment I’m playing on the left of a back three and Kenny is playing down the left, so playing on the same side we have a good relationship. Maclean, who turned 27 on Wednesday, and McKenzie have both signed extensions until the end of next season, with youngsters Seamus McConaghy and Joe Cuthbert also agreeing new deals with the Wee County. There are also outgoings at Station Park, with Danny Highet unavailable for the foreseeable future due to work commitments and Spaniard Inaki Fernandino-Soto requesting to leave due to a lack of first-team opportunities.